Police say a 49-year-old man opened fire at an upscale apartment complex pool Sunday evening. At least one person is dead and seven others injured after a gunman opened fire at an apartment complex swimming pool in San Diego. "We could see the shooter sitting there with a beer in one hand and a gun in the other," a witness said. Police told Newsy's partners at KGTV the woman who was killed was attending a birthday party at the upscale apartment complex. "There is a crazy guy that is shooting. So we just decided to run," another witness said. The gunman, identified as 49-year-old Peter Selis, was fatally shot by police after he tried to turn his gun on officers. 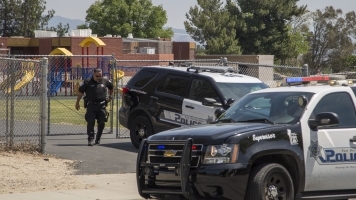 Police confirmed all of the victims were either black or Hispanic, and the gunman was white. Seven people were hit by gunfire during the incident. Another man broke his arm while fleeing the scene. San Diego Police Chief Shelley Zimmerman said authorities are still trying to determine a motive for the shooting.